Wreck at Batavia | THERMO Spoken Here! Feb 18, 1885, a train engine moving at high speed collided with a second, stat­ionary engine. The engines were identical, having been manufactured by the same company. The aftermath of the collision found engine "A" (initially stationary) situated near vertically atop the initially moving engine "B." The engine crews were killed but one witness judged the speed of engine "B" prior to the crash to have been "about ten miles per hour." A second observer claimed engine "B" was speeding "at least 100 miles per hour." What does an energy analysis of the event tell us? I. Energy Equation: Model the engines as deformable solids with their kinetic and potential energies represented in terms of center of mass. Take the system to be both engines taken together. Write, then simplify the energy equation using reasonable assumptions, facts, and information from the figure. involve changes of internal energy and heat. ΣQ = 0 : Of the energy equation terms, heat is usually easiest to address. Here, the event initiates a moment prior to collision and ends a minute or so later. Hence, since heat takes time, the heat of collision is approximately zero." ΣW = 0 : With the impact of collision large forces occur and displace obviously. If the tracks are not torn up all the forces acted interior to the system. Thus with the exception of the loud noise, work equals zero. ΔKEA = 0 : The velocity of engine "A" is initially and finally zero. ΔPEB = 0: Engine "B" experiences no change of elevation, hence no change of potential energy. The energy equation simplfies to this. Image Information: In the image provided, notice the man standing beside the wreck (front left). 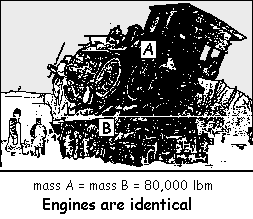 Assuming he is 6 feet tall then in proportion, the bottoms of the wheels of engine "A" are about 8 feet above the rails. Hence the center of mass of engine "A" was elevated about 8 feet when engine "B" went under it. The final velocity of engine "V2,B" equals zero. Also mA = mB = 80,000lbm. Eqn-5 is the energy equation representing the facts known. We see the terms, "ΔUA," and "ΔUB," and VB,1 are unknowns. A complete solution is not possible. However we can investigate one aspect of the incident. II. Calculate the least possible speed of engine "B." ♦ One witness said, "... the train was moving about ten miles per hour (~15 ft/s)." This sounds ridiculously slow. Now in the event, the kinetic energy of engine "B" transformed into its potential energy increase and the energy increase of damage of the steel vehicles. If we assume zero increase of internal energy of the engines then only the increase potential energy of engine "B" would happened. Our equation Eqn-5 can be solved for this limiting event. The answer obtained would be a lower bound. Let's run the numbers. (6) Leave algebra until the last step. Consequently we know for fact that Engine B was travelling faster than 33mph.